Park natural resources manager Mark Biel sits with border collie bark ranger, Gracie. Glacier National Park Natural Resources Program Manager Mark Biel was recently recognized for excellence. WEST GLACIER - Glacier National Park Natural Resources Program Manager Mark Biel has earned the 2017 National Park Service Intermountain Region Director’s Award for Professional Excellence in Natural Resource Stewardship. Biel launched the wildlife shepherding program in 2016. The program uses a trained border collie, Gracie, to move bighorn sheep and mountain goats out of areas of high visitor use, such as the Logan Pass parking lot. It also gives Biel the chance to talk about the importance of wildlife safety with visitors, schools, and community groups. 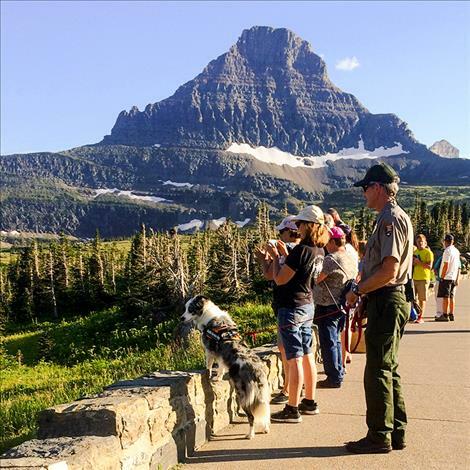 In 2017, the Public Lands Alliance presented the program with its “Partners Choice Award for Outstanding Public Engagement.” The project is funded through private donations to the Glacier National Park Conservancy. Biel also coordinated recent mountain goat research at Logan Pass and was instrumental in Glacier’s recent designation as the world’s first transboundary International Dark Sky Park, along with Waterton Lakes National Park in Canada. Biel’s career includes 24 years with the National Park Service. He came to Glacier National Park in 2010. 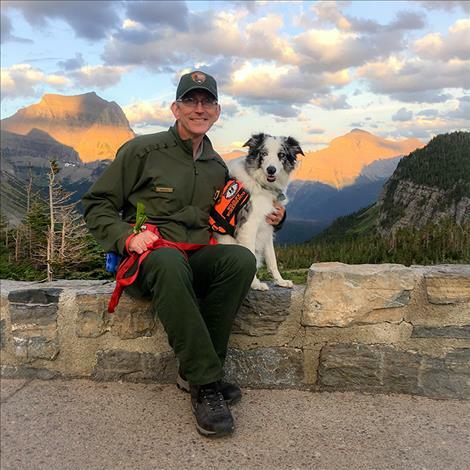 Prior to his time at Glacier, he worked at Devils Tower National Monument, Padre Island National Seashore, Bryce Canyon National Park, and Yellowstone National Park, where he started as a volunteer in the park’s Bear Management Office. He holds a master’s degree in Animal Science/Nutrition from the University of Illinois and a bachelor’s in Agriculture and Natural Resources from Michigan State University. Biel lives in Columbia Falls with his wife, daughter, and bark ranger Gracie. As the regional recipient of the award, Biel will compete against six other regional winners for the national award, which will be presented at a later date.